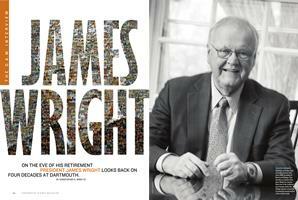 On the eve of his retirement President James Wright looks back on four decades at Dartmouth. Revolutionary advances in geography (can you say satellites?) 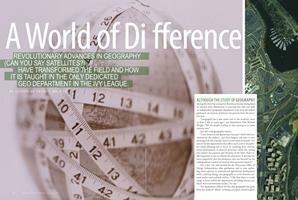 have transformed the field and how it is taught in the only dedicated geo department in the Ivy League. 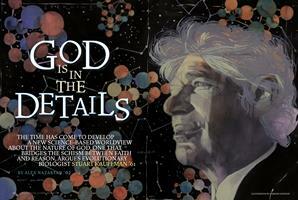 The time has come to develop a new science-based worldview about the nature of God, one that bridges the schism between faith and reason, argues evolutionary biologist Stuart Kauffman ’61. A Dartmouth geriatrician offers insight into a new prescription for eldercare. Deputy commissioner Bill Daly ’86 never played goalie, but he’s known for making one of the biggest saves in hockey history. Before they were chosen to serve in the new administration these alums gained valuable experience as undergraduates. The study of American architecture can teach us as much about history as it does about design. Dr. Jim Yong Kim doesn’t start his new job until July 1, but based on what people are saying, he’s already had quite an impact. Susan and Jim Wright depart Spaulding Auditorium following the introduction of his successor. “I’m blessed to have a spouse and a partner in Susan, who also lives and breathes Dartmouth,” he says.